This performance piece is an opportunity to uncover what it is I believe to have cause my stammering; as being the only person in my family with a stammer I know for one it isn’t genetic, I do however believe that there is a correlation of events that occurred in my life that could have cause it but it has never been fully proven. This series of work is something that I have involved in with creativity, I felt this was a big development in my work and has expose a journey of self discovery as I uncover the truth about myself. As before the body of work was involving re-inactments of underground films and quotes from poets or books, this was never anything that personal to myself as an artist and a stammerer. Alan Woodward’s ‘Voice in Exile’ demonstrates the power of a journey that dwells in the mind of a stutterer, Alan (being a stammerer himself) was the main source of inspiration to create a performance about myself rather than speaking in the words of others. Andrea’s ‘Projection’ creates a very powerful presence in her work as she portrays herself as both the patient and therapist. A psychoanalysis performance has the perfect appeal to my chosen subject, by putting myself into an analysis of myself I would be the role of patient and the audience would play the spectator. The performance is therefore much a story of my life, where I examine specific parts of my life where I believe there to be a possible link to my stammering. I feel my work is much more of an eye opener to the audience as society doesn’t really encounter stammerers that often, minus a few stutters I have never encountered another stammerer in my life, which I find is what makes us very unique. As my final piece is going to be more of an analysis into my persona; I have decided to lay out my performance as myself as the patient lying on a bed in the centre of a room, the viewers will have space to wander around me or simply listen to what I have to say. The performance will start outside of the room with a letter stated to “the viewer”, inside will be a short statement that all this time I have spoken behind the words of someone else, how I have deceived even myself and finally (as this is the end of the year) I will speak nothing but my own words. The audience will then enter the room to see my lying on a bed, I will be in full black to prevent any attention being driven away from anything else, they will focus entirely on my words. This is when I will begin my speech, moving rather slowly and a mix between stuttering frequently and subtly. Before the final performance I will need to have a couple of practice runs to see what else I can add to the piece (i.e makeup, stammering, positions and movements). For my final performance, I have decided to use my own, original script rather than working from someone else’s work. Poster – I remember when I was around 4 years old there was a poster advertising stammer; the poster consisted of a boy stuttering to his mother about going to the park, I would walk by this poster almost everyday, reading it everyday must have had a strong connection to what occurred later on in my life. Ulcerative Colitis – When I was around this age I was diagnosed with Ulcerative Colitis, this illness has a very strong connection to stress and a weak immune system. Although I have no memory of being immensely stressed at all, I can’t help but think that there is a link between the two. My best friend leaving – My best friend moved away shortly around this time as well, this caused quite a bit of stress more me as we were inseparable as that age. These events are all going to be parts of my performance as well as dealing with it on a daily life, along with sessions of speech therapy and other methods of preventing stammer. Later things to plan will need to be, the layout of my performance and any costume/makeup ideas. 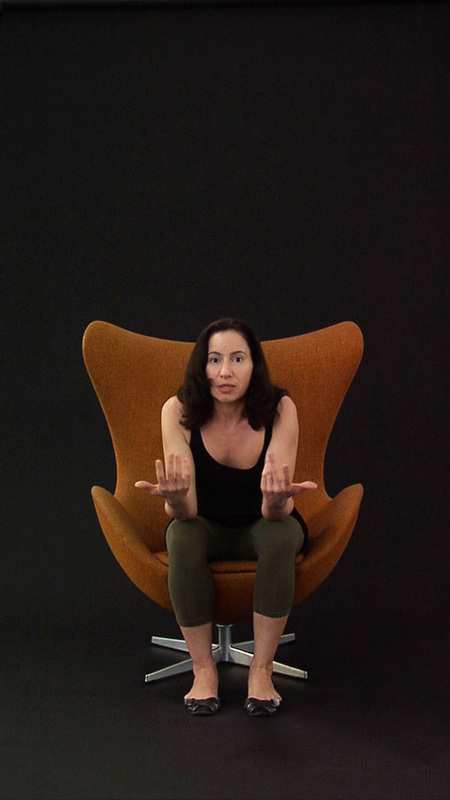 Projection is a video installation which stages a psychotherapy session, with Andrea performing as the patient, the therapist and the spectator. This piece takes me back to the beginning of the term when performing “When Murder Goes Wrong” in which I portrayed both the convict and the nurse. I aim to approach my final performance as a psychoanalysis of myself, as the patient I will reveal what I believe to be the reasoning behind my stammering. VOICE IN EXILE is an internationally acclaimed award-winning dramatic and archetypal film journey into the mind and emotions of Alan Woodward, a seventeen-year old stutterer, exploring the inner and outer trials and fears that stutterer’s often endure. The writer/director of this powerful cinematic work, Mark Allan Kaplan, is himself a stutterer and this film is the culmination of Mark’s deep personal quest to express the inner life of the stutterer through film. Looking back at my autumn term I realised that my final performance was my strongest outcome, therefore I am sticking to a performance piece. The piece itself has been influenced by many things over this term; it is an analysis how I obtained my stammer, I had a loopback at references to my childhood before I had it and found a few correlations but nothing certain. I find this mystery will give a bizarre appeal to the idea of how I got my stammer since I don’t know I find it rather creepy; the performance will therefore be me explaining my life when I got it and the series of events that could have possibly triggered this along with my own opinion of why I think I have my stutter. As for imagery I am deciding between body paint or all black, this will need more practice before confirmation – photographs will be uploaded later on in the blog as well as formatting of the performance.